naughty shorts! : Happy Saturday - Garage Sale Glee!!! There is hardly a weekend that will pass where I don't find myself perusing a garage sale or two. Some weekends are even dedicated to this activity. It is not uncommon to see me burning around town with a car full of newly purchased bric-a-brac, potplants, furniture, fabric, etc, etc... The hunt for a bargain is one of my favourite pastimes. This week however I had decided to give the hunt a rest. I was going to give the opshops a miss and the garage sales a wide berth. You see, my post-holiday pockets are empty! 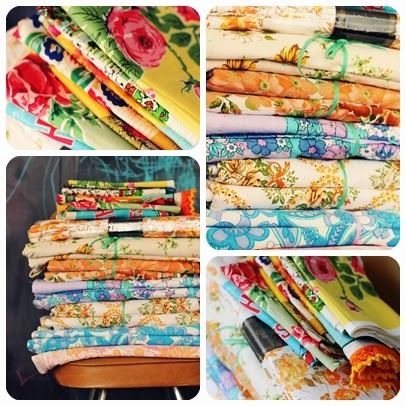 So, I was sitting at a friends house, watching the AFL grand final, as you do, when I received a message on my facebook page that read - garage sale on Dunsborough lakes drive, lots of vintage sheets and fabric, etc... Those of you who covet vintage fabric will know how hard it can be to come across. I can go weeks opping, garaging, ebaying, without finding a single worthy purchase. So I leapt out of my seat, left my child with my friends and raced around the corner in search of this promising garage sale. Within 5 minutes I had found the house and within 10 I had bought nearly everything this lovely lady had to offer. I reasoned to myself, what are overdraft accounts for, if not emergencies such as these?? So thank you so much lovely miss who tipped me off!! Happy weekend! Has anyone else found anything amazing so far?? Oh, My! I love your reasoning! It is so true, actually. If you were a big business start up, you would be funded by someone who would offer you money. I'm betting you're on your own in your business venture, and so, a little overdraft certainly won't hurt. How exciting! A pile of vintage sheets! So happy for your find. What a Pandora's box it must have been, I'd love to have seen the excitement as you descended on that vintage treasure. Anyway, I thought the AFL final was rather boring, even for a Hawthorn supporter (which I'm not). Just returned from a couple of days away visiting where we used to live on the coast. A morning was dedicated to all the old favourite op-shops and they didn't disappoint. Plenty of crockery and a couple of bits of milk glass. Wow, so lucky! Due to working every Saturday, I don't get the opportunity to get out to garage sales. I picked up a few 70's style tablecloths, even one with pineapples on it (which is my fav) from my local Vinnies. I do love op shops in Tassie, fortunately my sister lives there so I have an excuse to visit and shop!